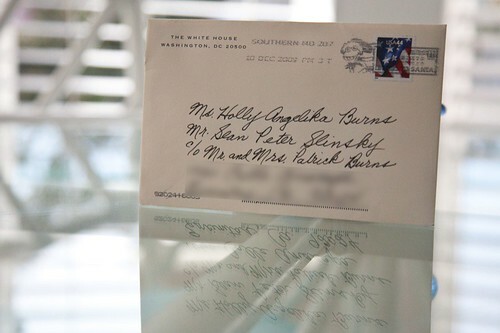 Turns out that when you send Barack and Michelle Obama one of your wedding invitations, they go one better than sending you a Crate & Barrel vase in return. This baby's a framer, don't you think? And I was excited about the Christmas card I got from them. This is even better--hand addressed, even! I'm jealous! Damn. Wasn't expecting that. Very, very sweet! That makes me wish we waited to get married til there wad a cooler president in office! That's a keeper!! I'm with Elysaneth. I wish we had waited just another year for a better prez!! You gotta frame it. Maybe do one of those side by sides with a wedding pic on one side and that one on the other?! i knew about this, then forgot to send an invitation in. but it doesn't matter because it was in 05, and framing a card from the former administration... well... um, no. Definitely frame it. And do you know where it would look really good? The newly painted hall. If you're concerned about privacy issues, you might want to blank out the address in the reflection as well. oh my, this totally makes me get all teary. I'm bummed that we could have done this for our wedding, but didn't think of it! Would have totally freaked out my crazy right-wing father-in-law, too. Ah well, missed opportunities. But thank you for sharing this. So cool! Um, totally amazing. I remember when you mentioned on your blog that you were inviting them. Who knew they would be proper enough to send a card – and within 6 months too! The Obama's continue to impress me! That's awesome! 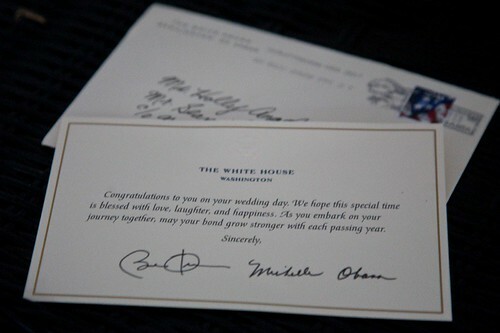 and HAHA "your journey"...maybe the Obama's are fans of Secret Bachelor Tuesdays? This is almost worth getting married all over again for. ahhhh! That's incredible... now I MUST get married while he's still in office so I can get one of my own, hahaha. Wow! Did they actually sign it? Made me tear up, I kid you not. That Prez of yours just wows me over and over again with his awesomness. okay that is amazing. love that you got a response. I wrote to Kenneth Branagh several times, and so far have only received letters back from his assistant. Guess I should try sending a holiday card to the old prez. That is just the most amazing thing ever! I did not even realize you could do such a thing. Mind you, I'm from Canada and I've never seen anyone send our Prime Minister a wedding invitation. And yes, the President's response is a framer! Congrats, by the way - you two are the sweetest couple. Wow. This just takes the cake. It's... the cat's pajamas... the bees knees... all of those things! Totally adding them to my invite list. That is so cool!! They have such a great marriage too, it's like an extra blessing. Or whatever. You know what I mean. Did you send an invite to the Queen too, as you planned? If so what was the response? Could make a good double framed picture if anything comes through! was finishing up some christmas dinner shopping at the grocery store and i happened upon tim tams by pepperidge farm. That is totally awesome! I'm sending them a wedding invitation as well! I'm also going to invite Bono . . . Seriously..this made me laugh so hard and also have twinges of jealously...damnit why didn't I invite Barack and Michelle to my wedding?!! !